“Local criminal justice policies, such as vagrancy laws and cash bail requirements, endanger vulnerable immigrant populations and undercut the promise of ‘sanctuary’ cities, according to a report released today by Harvard Law School’s Fair Punishment Project, the Immigrant Defense Project, and the Immigrant Legal Resource Center. 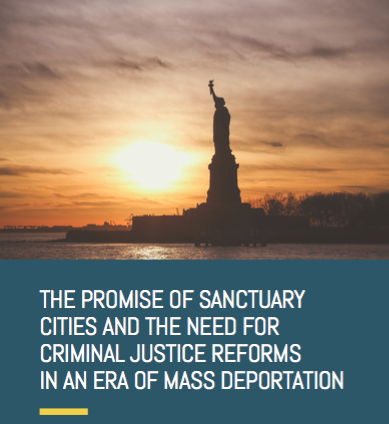 The report urges city and county leaders who want to protect immigrants to act swiftly to end harmful criminal justice practices that criminalize poverty and send undocumented residents into the deportation pipeline. “Unfortunately, some of America’s most progressive cities claiming to be sanctuaries cling to ineffective, outdated, and potentially dangerous criminal justice policies, including ‘broken windows’ policing, harsh drug laws, and burdensome cash bail requirements. “In New York, the Police Department arrests people for selling single cigarettes, jumping subway turnstiles, or trespassing. “Philadelphia still has ordinances in place against begging and panhandling and sleeping on streets. “Phoenix has broad prohibitions against ‘camping’ on any city property, including sleeping activities, or making preparations to sleep, including the laying down of bedding for the purpose of sleeping, or storing personal belongings, or making any fire, or using any tents or shelter or other structure or vehicle for sleeping or doing any digging or earth breaking or carrying on cooking activities. “In Portland, Oregon, the Multnomah County District Attorney has a ‘Neighborhood Unit’ that focuses on prosecuting low-level, ‘quality-of-life’ offenses such as trespassing, disorderly conduct, and public urination. End All Local Collusion with ICE. Mayors, city councils, county commissioners, and other public officials should prohibit all government agencies—particularly those in law enforcement—from working with immigration authorities. Local law enforcement should not honor warrantless detainer requests, collect information about an individual’s immigration status or place of birth, or share information with ICE beyond what federal law requires. Do Not Enter Into 287(g) Agreements. To effectuate its policies, the Trump Administration is counting on local police to enter into 287(g) agreements that deputize local police officers as de facto federal immigration agents. Police chiefs and sheriffs must refuse to enter into these damaging agreements, which dramatically increase the Administration’s deportation capabilities and lead to racial profiling. Similarly, local law enforcement departments should not participate in joint task force operations with ICE. Stop Asking for Cash Bail. Cash bail keeps poor people in jail for low-level crimes. That is bad policy in any context, but it is particularly dangerous for non- citizen detainees who sit in jail at the mercy of an increasingly aggressive federal deportation force. Prosecutors must stop asking for it. Decriminalize Certain Offenses. Harsh local ordinances do not measurably serve the public good, and instead, unnecessarily expose non-citizens to deportation. Local lawmaking bodies should decriminalize low-level offenses that too often target black and brown communities. Cities should, at a minimum, create civil enforcement options for low-level crimes, which would reduce the number of arrests and decrease over-incarceration in local jails. End “Broken Windows” Policing. Broken windows policing does not increase public safety. Instead, it leads to racial profiling of communities, over-incarceration at local jails, and increased deportation of non-citizens. It is past time for cities to abandon this method of policing. District attorneys should stop prosecuting these cases, and should, at a minimum, create pre-plea diversion programs for low-level offenses. Consider Immigration Consequences in Discretionary Decisions. Prosecutors, who wield extraordinary power over a non-citizen’s fate, should consider immigration consequences at all stages of the criminal process, starting with the initial charging decision and lasting throughout plea negotiations. Additionally, prosecutors should work with advocates to create simplified post-conviction procedures for non-citizens who received ineffective advice as to the immigration consequences of their conviction. Ensure Public Defenders Have Resources to Meet Constitutional Obligations to Noncitizen Clients. The Supreme Court has held that the Sixth Amendment requires defense counsel to advise non-citizen defendants of the immigration consequences of a potential conviction. In order to fulfill this obligation, local governments must adequately resource public defender offices. Informed defenders can make all the difference in someone’s immigration case and help keep families together. Get Police Out of Local Schools and End Probation Reporting of Youth to Immigration Authorities. When offenses occur in schools, they should be dealt with internally. Especially given potential long-term immigration consequences, it is imperative that prosecutors and law enforcement officials revisit harsh arrest policies that have been shown to disproportionately impact youth of color. Posted in Government, Leadership, police and tagged broken windows, Fair Punishment Prjoject, low-level offenses, police, sanctuary city. Bookmark the permalink.